Jagdish Tytler, Union minister of state for non-resident Indian affairs, is fighting to have his share of the pie from the ministry of external affairs, which seems loath to let go of the NRI affairs department. He currently operates out of a small room in South Block, which was earlier used by MEA officials to meet foreign dignitaries. He is also fighting for more funds and more work. The government has allocated just Rs 7 crore to his ministry. His differences with the MEA on the allocation of work to his ministry have become public. Many say the NRI ministry has been carved out of the MEA for no apparent reason and is a waste of taxpayers' money. 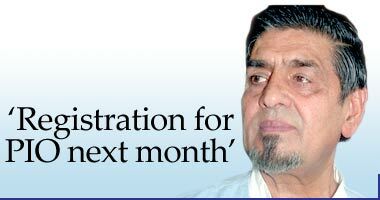 Tytler, the Lok Sabha member from Delhi Sadar, shared his views on his new assignment with Ehtasham Khan. How difficult is it to start a ministry from scratch? It is not a new thing for me. I had started two new ministries. I was the first person to do it. It is very simple, not difficult. Putting forward the problems of NRIs is my objective. What was the need to set up the NRIs ministry? It is for the satisfaction of NRIs. They had to run from post to pillar to get things done. They don't have so much time. They want single window clearance. That is how this ministry was created. What about dual citizenship for PIO [Persons of Indian Origin]? It is almost done. Registration will start in less than a month. It is currently with the law ministry for technical reasons. Everything is clear. We just have to decide the registration fee that will be charged [from people who wish to have dual citizenship]. It will begin with 16 specified countries. It will be extended later to 70 countries. What is the idea behind dual citizenship? How can India gain from it? They [the PIO] will be considered Indians. They will get many benefits. They will not require any visa to come to India. Apart from the non requirement of a visa, what other benefits exist for PIO? Some investment schemes will be made; some economic zones will be created. We would like them to come to this culture. Will the PIO have voting rights? No, no. There is no question of that. How do you see your ministry a couple of years down the line? We are coming out with a policy. It will be announced at Diaspora 2005 [the next Pravasi Bharatiya Divas]. What is required to be done, how we can help each other, what India can do for them. Is there any indication what the NRI ministry's functions will be? We will provide single window clearance for NRIs. They had complaints about red-tape and bureaucratic hurdles. Now they have the ministry. We are working as per the demands raised in Diaspora [Pravasi Bharatiya Divas] 2003 and 2004 and also the recommendations given by the committee on NRIs headed by Dr [L M] Singhvi. We will try to attract huge investment, especially in real estate. We plan to build NRI cities. The first one will come up in Bangalore. We will also try to ensure the safety and security of our people living abroad. We have plans to prepare a database of PIO and NRIs. This is my first priority. A meeting was held on August 6 on allocation of work to your ministry. What happened? The final meeting is yet to take place. It will happen soon. I am told no decision could be taken at that meeting because of differences with the MEA. No, no, that's incorrect. There is no difference. What plans do you have for Indians, especially the labour community who get exploited abroad? Yes, yes. There are problems people in the Gulf face. We are trying to coordinate with other governments and our embassies. We will see their [NRIs'] problems are directly dealt with by the Government of India. Our ministry has just started. Very soon we will take it up. There were reports that NRIs in the US have to pay taxes that are meant for retirement benefits. But many NRIs don't stay in the US for long, hence they lose thousands of dollars every year. How do you plan to tackle this? There are laws in other countries with which we cannot interfere, just as they cannot interfere in our laws. But if the complaint comes, then the ministry will take it up. It is good you have raised this point. Let us see. How do you expect your ministry will help the country three or four years from now? I would expect [NRI] investment, currently at 10 percent, to easily go up to 25 percent. We will make life easier for them [NRIs].